New style 2015 Vodafone Warriors Under 20s Home Jersey is the main playing kit and is a replica of what the NYC premiership team will be wearing next season. Using the same core colours as the NRL playing kit links our teams together and a unique design gives them their own identity. Featuring the black and silver NZ version of the NRL Holden Cup U20s logo and the 20 Years Vodafone Warriors logo embroidery on the left chest. 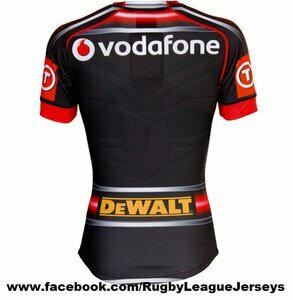 20 Years Vodafone Warriors logo on the left chest so you can wear it with pride.